Arthur Kenney was known as the Great Red. 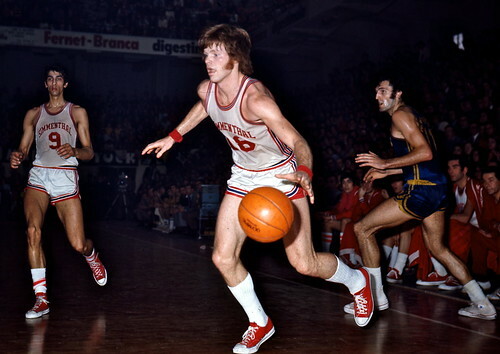 But everybody called him simply Arturo and in the Seventies he became symbol of the warrior mentality of Olimpia Milano, contributing to one Italian championship (but playing three tie-breaker games in as many seasons), two European Cups and one Italy Cup. And also a Champions Cup semifinal. Kenney was a strong and physical power forward who could also play as center, with a great spirit (memorable his competitive rage fueling legendary tales like the Moka Slavnic chase in Belgrade right into the stands to protect his untouchable coach Cesare Rubini) and underrated skills. A New York native, he played for the best high school team ever assembled, at the Power Memorial of Manhattan where the star was Lewis Alcindor, who later became more famous under the name of Kareem Abdul-Jabbar, a team elected into the Hall of Fame. The assistant coach for that team was Richard Percudani (the head coach, Jack Donohue brought the Canada National Team to the semifinal at the 1976 Olympics) who eventually coached Pallacanestro Milano and also in Varese. Kenney was coming from France (and in France returned eventually), after completing a Hall of Fame career in Fairfield where he was coached by George Bisacca, who went on to coach Virtus Bologna. In Milano, he found a second home: he was loved by the fans and his teammates, he was an indomitable rebounder, learned the language (he can speak Italian even now) and left everything he had on the court. He was the anti-Meneghin in an era of a great rivalry between Milano and Varese. He stayed three years and was part of Olimpia’s history: not the best player, not the first to win a European trophy, but the first to be a fans darling and to be linked forever with the team, including his excellent post-basketball career in Wall Street (his email address is another tribute to the team and to the number he wore). In 1971/72, however, he was the team’s leading scorer, in 1972/73 he had a 61.0% from the field. During all of his three years in Milano, he was the team’s best rebounder. Art Kenney was born in New York on May 5th 1946, played 71 league games with the Simmenthal jersey averaging 14.3 points per game and 11.8 rebounds.